A new review paper from SPPI and CO2 Science finds on the basis of observations that the response of the climate to radiative forcing from clouds indicates that the "concomitant 20-year change in radiative forcing due to CO2 alone would have had to have been truly miniscule, which suggests that all of the angst manifest by climate alarmists over anthropogenic CO2 emissions may be wholly misplaced" and "it would appear that earth's climate is much less responsive to changes in radiative forcing than the world's climate alarmists and most climate modelers claim it to be." 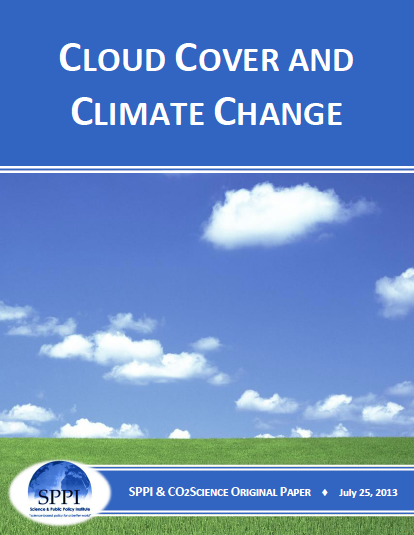 Understanding how clouds respond to anthropogenic-induced perturbations of our planet's atmosphere is of paramount importance in determining the impact of the ongoing rise in the air's CO2 content on global climate; for as Charlson et al. (2001) have noted, "man-made aerosols have a strong influence on cloud albedo, with a global mean forcing estimated to be of the same order (but opposite in sign) as that of greenhouse gases." And because of the great importance of this complex subject, this summary presents a brief review of a number of scientific papers that address various aspects of this crucial issue. he estimated cooling power of these aerosols -which they said was generally believed to be equivalent to the strength of the warming effect of all anthropogenic greenhouse gases - may actually be too conservative. Although real-world studies thus continue to elucidate the workings of the planet's complex climate system and improve our understanding of it, there continue to be major problems with computer models that attempt to mimic it. Finally, Palle et al. note that the increase in radiative forcing produced by the concentration increases experienced by all greenhouse gases since 1850 was something on the order of only 2.5 Wm-2. Compared to the increase in radiative forcing that may have been experiencedbetween 1985 and 2005 as a result of observed changes in total cloud amount and the fractions of clouds located at different elevations (~11 Wm-2, according to the data and analyses of Palle et al. ), the concomitant 20-year change in radiative forcing due to CO2 alone would have had to have been truly miniscule, which suggests that all of the angst manifest by climate alarmists over anthropogenic CO2 emissions may be wholly misplaced. And if a radiative forcing on the order of 11 Wm-2 only raised mean global air temperature by a fraction of a degree, as occurred between 1985 and 2005, it would appear that earth's climate is much less responsive to changes in radiative forcing than the world's climate alarmists and most climate modelers claim it to be.